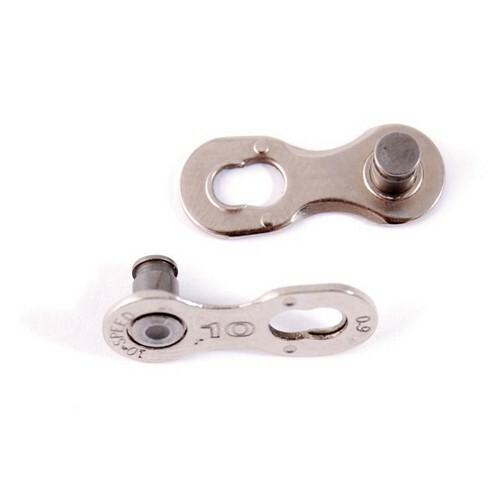 Quick and easy joiner link for YBN 11 speed chains. Also works with other brands of chain. Never go anywhere without spare links.....Just in case! These links enable me to clean my chain without the problem of replacing chain pins. Very useful item. When you going to training, need extra one chain link in the bike bag or your jersey packet :) This product makes so easy to fix problems. Handy and does the job well. Have this in both mine and my partner's bikes and easy to take off when needed. It does the job. I have been used a few without problems for a year and half. I have used three of these so far (three chains), and I regularly take the chain off for cleaning and have had no issues so far. These are a good item and I bought them as I wanted to clean my chain properly which means taking it off the bike. I used the multi tool to split my chain, give it a thorough clean and then fit the quick release link, chain back on bike. The link fitted my Shimano Ultegra chain easily but I do have a set of chain pliers so makes it pretty easy. The only issue I had is when first fitted the link is particularly stiff, given plenty of oil and running around the gears it has finally loosened up, so worth bearing in mind if fitting for first time out on the road. Quick link is now a must. So easy to use versus the old pin system. Works with Campy Chorus chain, will buy few more and pack into saddle bag for emergency use. Purchased as an emergency spare for the back pocket but have used this type before and they do the job perfectly. A quick solution to a somewhat rare problem on the road. Cleaning the chain becomes a really easy task, also saving you from the wife's wrath by making the otherwise messy job of cleaning the chain considerably neat and clean. These work on perfectly on shimano 11 speed chains, just the job for regular cleaning and the price is amazing! Love a good quick link, makes it so much easier to take the chain off for proper cleaning. Great item. Does what it says on the tin. Used on a dura ace chain with no issues. Seems ok. Exactly what I expected. Claims to fit SRAM, Shimano, and campy chains. Haven't needed them yet, but critical if you get a broken chain a long way from home. Can always ride home with one gear less but gotta have the chain. Worked perfectly on an 11 speed Shimano chain. Quick links are great ideas and helps to keep the chain clean [quick easy removal for cleaning] without the dirt being transfered to the frame. Especially white frames.